Hello again omg I just love this new stamp how cute is Humpfrey and what more this stamp set was a free gift with Papercraft Essentials magazine. 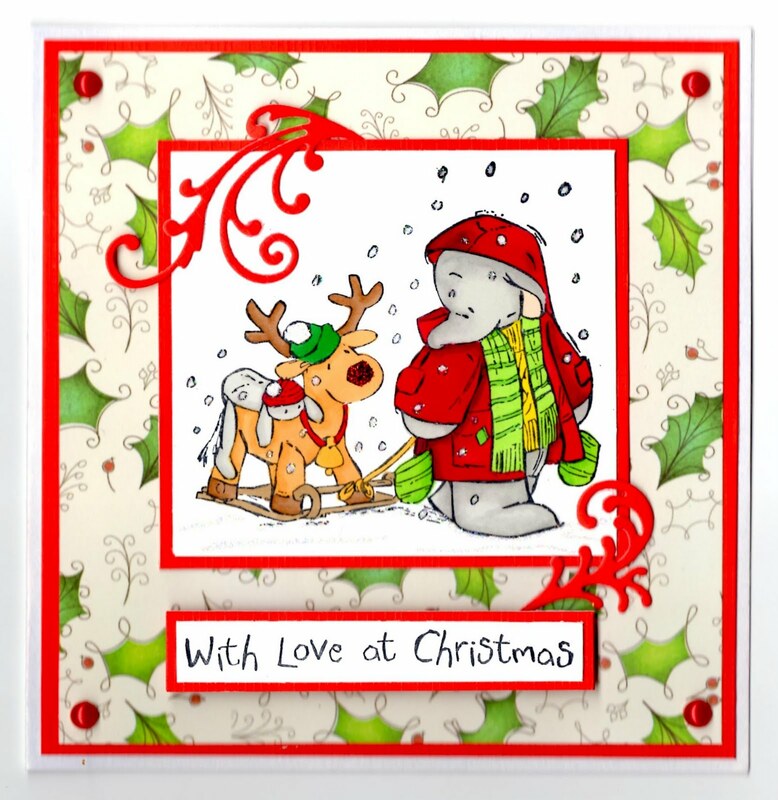 I have coloured him with promarkers and highlighted the snow with crystal glitter I also used some red art glitter for Rudolph's nose.I have made this one quite simple and embellished with swirls from a marianne die set and some red pearls for the corners I hope you like this one. What a cutie patootie. My son would just love this card. He is an elephant lover. You don't see many images with a sweet elephant like this-it's just adorable. Great job! Thank you so much for playing along with Speedy's the Cat Friend's Challenge. It is a pleasure to visit and see what you made for us! Oh gorgeous!! love the bold colours thanks for joining us at FF good luck! Just so gorgeous hun...and super colouring too...! Such a pretty bright and cheery Christmas card! Thank you for playing along with us this week at Speedy the Cat's Friends challenge! What a great Christmas card!!! Very cute!! !Thanks for playing along with us this week at Speedy the Cat's Friends challenge! This is colored beautifully! Great card! oh this image is so cute and coloured so lovely as well. Thanks for joining creative card crew this week. Hi my sweetie how are you shug? This is such a gorgeous crimbo card the image is lush I got this stamp as well hun I have this mag on subscription....it came day before I went into hospital so I took it with me to have a good read lol. Fabulous colouring on the image hun. Thank you so much for hopping in Jo's birthday blog hop and following my blog. I'm a new follower here too! You do beautiful work! 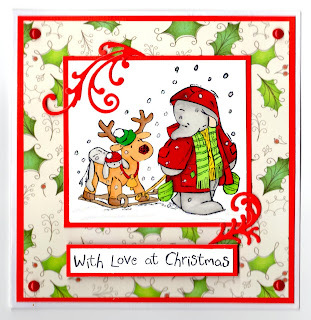 I love Christmas cards, they are so fun to do! I also checked out some of your other projects, wow! I'm excited to see more! Cute! Christmas already? I need to get started on my shopping! I like your shadin on Humphrey & love the way you picked out thsoe light holly leaves in the paper with your colouring of his scarf. The traditional colours are superbly effective. Hope you're OK. Trying to do a little gardening each morning & have a little bit of order returning after all the building work. What a sweet Christmas card. love your coloring and your DP. Thanks for playing along with us here at Speedy the Cat's Friends challenge this week. Hope to see you again next week.